Piper Jaffray analyst Gene Munster has long been one of the strongest advocates for an Apple-branded television set, and with increasing claims of just such a product pointing to a launch as soon as the second half of next year, it seems that his persistent confidence in the idea may be panning out. - Full-fledged television set. Given that Apple seeks to streamline the user experience and its recognition that users don't really want yet another set-top box, Apple will almost certainly be going for an all-in-one solution. But given that Apple does not currently offer a full suite of television content offerings, most users will likely not be able to cut ties to their cable or satellite providers. Apple's TV will instead serve as an advanced interface that still draws upon the standard signal coming in from a cable box. - Range of sizes and twice current pricing. Munster believes that Apple will introduce its television in a range of sizes, recognizing that customers have different needs. He also believes that Apple will price its television at approximately twice the prevailing market price of similarly-sized televisions. The price premium would cover the additional hardware and software necessary for integration with the Apple ecosystem while also preserving Apple's high profit margins in a competitive market. - Simplicity and Apple's ecosystem. Aside from the rumored Siri voice-powered interface, Munster predicts that the Apple television will integrate with iOS devices and Apple's content ecosystem for video, games, and apps, serving as another hub for digital entertainment tied into Apple. The interface will likely include a traditional remote control, but also iPad and iPhone apps for controlling the set's features, as well as Siri voice control that seeks to remove much of the complexity of interacting with television sets. Users will simply be able to input or say "ESPN" to be taken to the sports channel rather than having to look up or remember the channel number. In line with some of the other predictions and rumors, Munster sees the Apple television set making an introduction late next year, in time for the 2012 holiday shopping season. Anyone could have come up with that speculation. It doesn't reveal any information that anyone wouldn't have normally assumed. if they double the price i don't see them selling a ton...I know it won't be on par with the TV's, but double...not buying it. Anything Munster says is pure BS, he's been wrong so many times he has no credibility left. They could put the price at 7000$ people would still buy it. 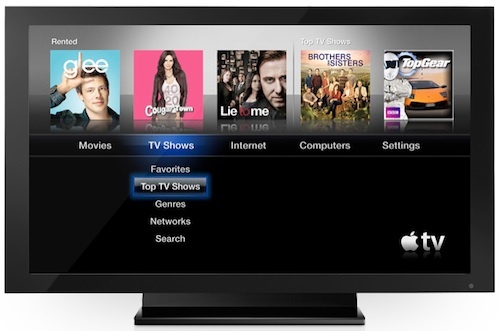 True Apple Television needs to be $1100 (maybe $100 more for integration). Apple's competition here is itself. No one will pay $2000 for a 55" Television. Period. People replace their cellphones every few years. People replace their computers every three to six years. People replace their television every decade or two. The small :apple:TV box is still the best way to go about the whole idea. It's small, low-cost and works with any television with an HDMI input. And because of its low price, it doesn't really matter if it must be replaced every few years. I'm not saying an Apple television set is a bad idea, but if it's the only option and they remove the current little :apple:TV box as an option, it'll never catch on as much as it could be. The goal here shouldn't be to replace Sony, Sharp and other television manufacturers. The goal should be to replace all those cable and satellite companies as content providers. They need to strong-arm the TV business into delivering cheap content the "Apple way", just like they did with music. You do realize that you are wasting money. Right? LED just refers to the light source. It's a clever marketing term because people confuse them with OLED TVs which cost like three to four times as much.